On Monday 22nd April 2019 the sun will rise at 06:00 and will set at 20:17. It will be a mild day, with temperatures reaching around 20.2°C. Today is expected to be a dry day, with a very low chance of rain. It will be quite a breezy day, with a maximum expected wind speed of 16mph. On Tuesday 23rd April 2019 the sun will rise at 05:58 and will set at 20:19. It will be a mild day, with temperatures reaching around 21.3°C. Today is expected to be a dry day, with a very low chance of rain. It will be quite a breezy day, with a maximum expected wind speed of 18mph. On Wednesday 24th April 2019 the sun will rise at 05:56 and will set at 20:21. It will be a mild day, with temperatures reaching around 12.8°C. Some moderate to heavy rain is expected, 5mm of rainfall is possible today. It will be quite a breezy day, with a maximum expected wind speed of 23mph. On Thursday 25th April 2019 the sun will rise at 05:54 and will set at 20:22. It will be a mild day, with temperatures reaching around 12.4°C. Today is expected to be a dry day, with a very low chance of rain. It could be quite a gusty day today, with a maximum expected wind speed of 28mph. On Friday 26th April 2019 the sun will rise at 05:52 and will set at 20:24. It will be a mild day, with temperatures reaching around 13.6°C. Today is expected to be a dry day, with a very low chance of rain. There could be quite a strong breeze in the air today, with a maximum expected wind speed of 24mph. On Saturday 27th April 2019 the sun will rise at 05:50 and will set at 20:26. It will be a mild day, with temperatures reaching around 12.7°C. Some moderate to heavy rain is expected, 5mm of rainfall is possible today. It could be quite a gusty day today, with a maximum expected wind speed of 31mph. On Sunday 28th April 2019 the sun will rise at 05:48 and will set at 20:27. It will be a mild day, with temperatures reaching around 6.1°C. Today is expected to be a dry day, with a very low chance of rain. There will be a gentle breeze in the air today, with a maximum expected wind speed of 17mph. 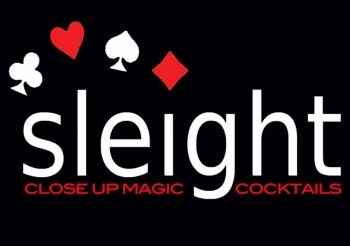 Sleight is Bath's only Magic Bar. We are open every Thursday, Friday and Saturday 7pm-1am with live magic from our resident magician Paul Brookes and other top magicians from all over the world. We have 241 cocktails on a Thursday (not through January) as well as served normally on a Friday and Saturday too with other drinks offers. Sleight is perfect for all groups, hens, stags and other celebrations, with private alcove booth seating areas with our help you could create the perfect VIP treatment for your group with surprises along the way. Please get in touch if you would like to hire out one of our booths.